The main opposition party in El Salvador has said it accepts defeat in the presidential election held on 9 March, after losing several appeals for a recount. The Arena party says it will make "democratic, serious and honest" opposition to the new president, former rebel leader Salvador Sanchez Ceren. Arena candidate Norman Quijano lost the vote by 0.22 percentage points. El Salvador remains deeply divided 22 years after the end of its civil war. Mr Quijano had complained that votes for the governing candidate were counted twice. On Tuesday, the electoral court rejected his party's latest appeal for a vote-by-vote recount. In a statement, Arena says it was willing to work for the success of the country's democracy. "As proof of our democratic vocation and respect to the institutions, we accept the Supreme Court's decision against a vote-by-vote recount," read the statement. "We will be watching the government and making sure it respects the law. But we will be the first ones to applaud their achievements." Mr Sanchez Ceren, from the governing FMLN party, was widely expected to win the runoff vote by a comfortable margin, after getting very close to securing a first round win. But Mr Quijano made gains in the past weeks of the campaigns. He made repeated comparisons between Mr Sanchez Ceren and the left-wing Venezuelan President Nicolas Maduro, whose government has faced nearly two months of protests over inflation and crime. 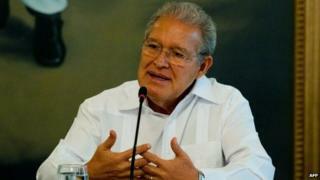 Mr Quijano warned that economic chaos would follow in El Salvador if his rival won. Mr Sanchez Ceren campaigned as a moderate despite his past as an active guerrilla leader during El Salvador's civil war (1980-92). His party, the Farabundo Marti Liberation Front (FMLN), turned from a rebel group into a political party at the end of the conflict. Since being declared the winner, Mr Sanchez Ceren has made conciliatory remarks, inviting the opposition in his "efforts to rebuild El Salvador". The president-elect has announced he will visit several Central American countries in the next few days. He said he would visit the United States before taking office on 1 June.